Reporter: You started the war as a cavalry officer, yeah? Baron Manfred von Richthofen: Yeah. Reporter: So, now, how does it feel to fly? To fight in the sky? Baron Manfred von Richthofen: My ancestors were Teutonic knights; I've merely exchanged my horse for an airplane. Reporter: [laughing] I see, so the flying is just a means to an end? Baron Manfred von Richthofen: The flying is wonderful! But it's the hunt that I find most satisfying: the stalking, the chase, and finally the kill. The climax. Reporter: Oh, so you enjoy it sir? 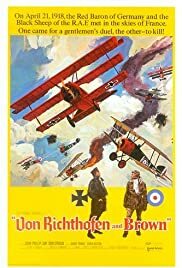 An entertaining movie about the World War I exploits of the ace German pilot Manfred Von Richthofen's (aka, the Red Baron) and his main opponent, Canada's Arthur Brown. The aristocratic Von Richthofen is so honor bound that he refuses to use camouflage paint on his planes, because "a gentleman should never hide from his enemies" and instead paints them with the brightest colors. The pragmatic, no-nonsense Brown, instead, does not believe in honor or chivalry: he just wants to win. I can't vouch for the complete historical authenticity of this movie – to mention just one instance, the actor portraying Hermann Goering looks nothing at all like the future Reichsmarshall, and his role in the flying circus was not as prominent as the movie implies. But as an entertainment (by the well known horror low budget film director Roger Corman) this movie is certainly well done. Sure, there is some corny dialogue here and there, and having Von Richthofen speak English in the movie with a heavy German accent was probably not the best idea, but the magnificent shots of period planes fighting in the air over the patchwork fields below separated by hedgerows (shot in 1971 with fearless stunt men, well before digital imagery started appearing in films) more than makes up for this movie's shortcomings. The great color photography is another plus.